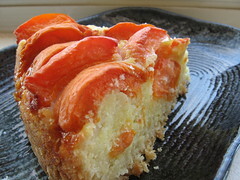 Apricot Coffee Cake - Do You Know The Muffin Man? Notes: The “batter” of this cake resembles a soft, crumbly pie dough and I contemplated adding more milk. However, from the comments on the original post, it seemed to work out for several other people so I left it alone. 500 g of apricots is quite a lot, and I was pleased with how much fruit was on top. This was a surprise hit at work. The cake is a little dry and crumbly, but turned out quite nicely. 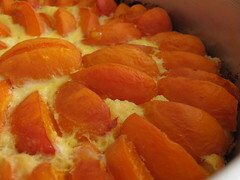 The tart apricots balance the buttery cake, and there aren't any spices or flavourings to complicate things.